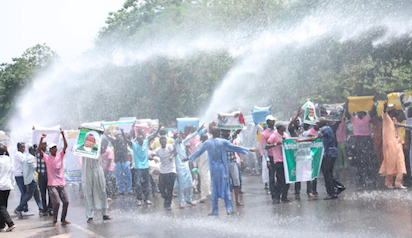 Home / Unlabelled / Police tear gas El-Zakzaky protesters in Abuja with water Canons. 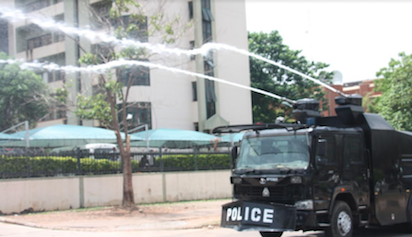 Police tear gas El-Zakzaky protesters in Abuja with water Canons. Operatives of the Nigerian Police Force on Monday in Abuja tear gassed scores of Shiittes protesters demanding the release of the leader of the Islamic Movement of Nigeria IMN, Sheikh Ibrahim El-Zakzaky. The protesters who converged at the office of the National Human Rights Commission, had marched through streets, displaying placards, calling for the release of Sheikh Zakzaky. However, police personnel armed to the teeth, including support of armoured personnel carriers, mobilized to the scene and dispersed the protesters with use of tear gas and water cannons. Before Mondays protest to the National Human Rights Commission, the unrelenting followers of El-Zakzaky had carried out similar protests to the National Assembly but were also stopped by the police. There has been pro-El-Zakzaky protests across the country since his arrest with his wife and detention by the DSS December 2016 following a bloody clash with the military in 2016 in Zaria, Kaduna State. 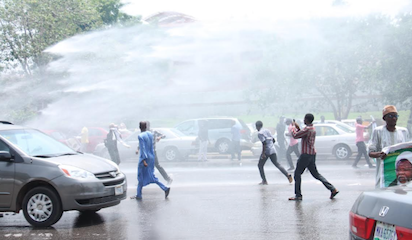 Police officers using tear gas and water to chase members of Academics Forum of the Islamic Movement in Nigeria during a protest demanding the release of their leader, El- El-Zakzaky at the entrance of National Human Rights Commission in Abuja.